One thing about really cold winter days, they tend to be very bright with sunshine. As I mentioned yesterday, the wind kept most of our deck clear of accumulation, even though I bet we received around 2 to 3 inches. Since the precipitation started as a foggy drizzle before the temperature dropped back below freezing, surfaces received an icy glaze for a base coat. 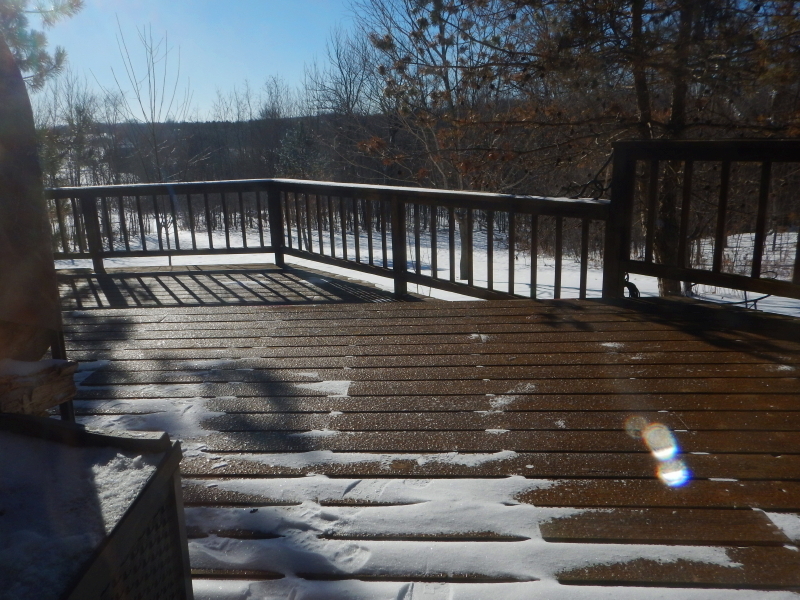 When conditions changed to wind-blown snow, instead of accumulating on the deck, it acted as more of a polishing agent. I failed at making an indoor nap the primary accomplishment of my day yesterday. There was a mess of snow that drifted on our front walkway which needed to be cleared, so I used that as an excuse to force myself up and out into the Arctic air. One thing led to another and I kept working my way along the driveway in front of the garage doors. At that point, I couldn’t stop myself from getting out the Grizzly and plowing the full length of the driveway. In the grand scheme of winter plowing, it wasn’t my best effort, but it will do for now. The surface is a frozen mess of layers from the changing conditions of the last month or two. We’ve packed down countless minor dustings by driving over it until it becomes a solid slippery coating, after which a warm spell turned some of it to pure ice and other areas to a slushy series of tire tracks. The subsequent plunge in temperature has locked all of this up tight and then firmly filled in the crevices with wind-blown snow. The plow blade basically bounced around and over the frozen pathway, as opposed to cleaning it down to the asphalt. We’ve got plenty of sub-zero sun shining down, but it isn’t going to improve the surface of our driveway any. That will require the next wave of warm Pacific air when the jet stream shifts again, which forecasts hint could be just a week away. There’s never a dull moment in our Wintervale weather adventure land lottery.